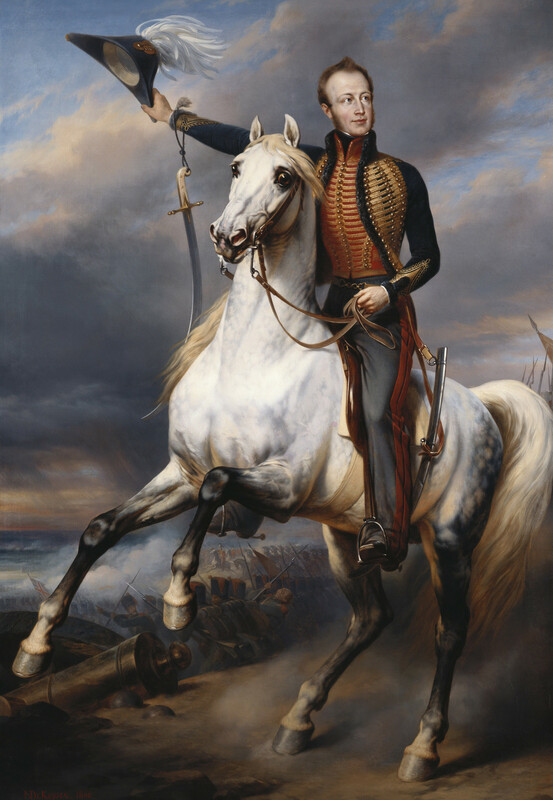 Full-length, astride a rearing grey horse, in hussar uniform; he holds his plumed hat in his extended right hand, and a sword hangs from his right wrist; the battle of Waterloo rages in the background, on the left William II (1792-1849), King of the Netherlands from 1840-49, was the eldest son of King William I and Wilhelmina of Prussia. In 1811 he served as aide-de-camp to the Duke of Wellington, taking part in several campaigns of the Peninsular War. In 1813 he was promoted to the rank of Major General after serving as aide-de-camp to the Prince Regent. He was commander of I Allied Corps at the Battle of Quatre Bras, and at the Battle of Waterloo. He was admired as a courageous soldier, and by the people of the southern Netherlands, as a popular ruler. See also RCIN 404693 Nicaise de Keyser (1813-87) studied at the Academy in Antwerp with Mathieu Ignace Van Brée. He exhibited altarpieces influenced by Rubens at the Salons of 1834 and 1835. After success in 1836 with his huge canvas, Battle of the Gold Spurs, he received commissions from royalty and from prominent families at home and abroad. In 1848 he became a member of the Koninklijke Academy in Brussels, and in 1855 he was appointed director of the Academy in Antwerp. His large history paintings and his genre scenes deal with Romantic subjects, but the execution is often cold and academic. Although celebrated during his lifetime, his art was soon forgotten after his death.